A high proportion of Gairloch pupils take part in the Air Training Corp (ATC). This very successful group enjoy many fun activities such as survival training, shooting, learning to navigate and flying small planes. 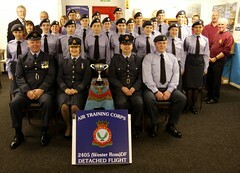 Recently they won the Hinshelwood Trophy for being the best unit in Highland Wing 2007. They were presented with their trophy on Monday 10th March.